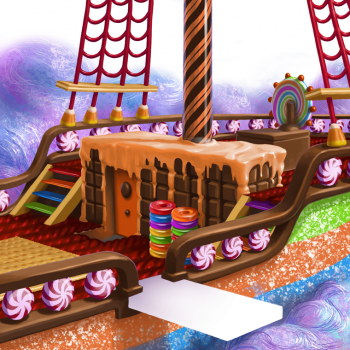 A flying galleon made out of delicious candies and other assorted goodies and treats. If the cheese fails to attract the mice, the sickly sweet scent of this sugary ship will certainly steal their attention. The Limited Edition Goody Galleon Trap Skin can be used on the Limited Edition Admiral's Galleon Trap trap. The trap's stats (power, power bonus, attraction bonus, etc.) are not changed. The Goody Galleon Trap Skin was obtained during the 2018 Halloween event. 17 October 2018: The Goody Galleon Trap Skin was introduced with the start of Admiral Arrgh's Revenge. This page was last edited on 21 January 2019, at 22:25.